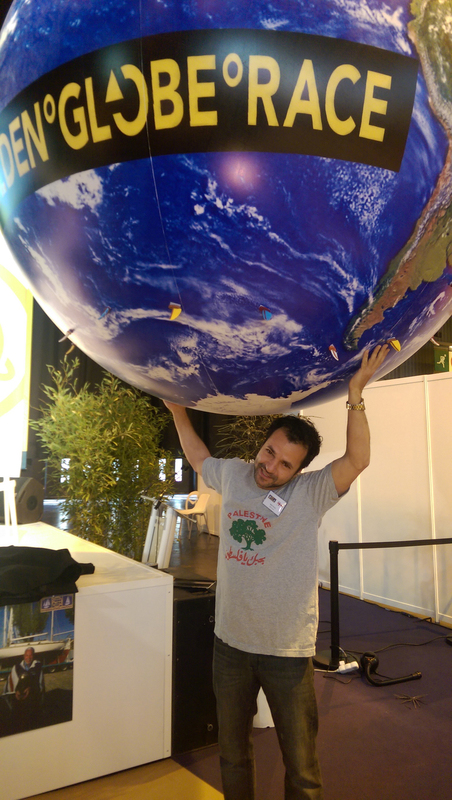 USA/Palestinian skipper Nabil Amra with the weight of the world on his shoulders. The former foreign exchange trader from Minnesota is racing against time to get his Biscay 36 LIBERTY II launched and trialed under jury rig before completing his 1,000 mile solo qualification in the four weeks before the Suhaili 50 Falmouth Parade of Sail starting on June 11. 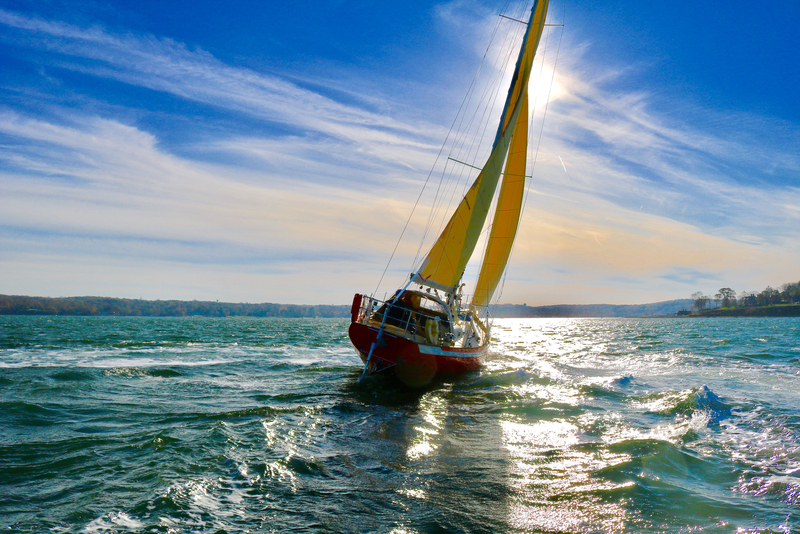 Falmouth waterfront and old harbour will host the Suhaili 50 Falmouth Parade of Sail between June 11-14 to commemorate the 50th anniversary of Sir Robin Knox-Johnston's departure from the port at the start of the 1968 Sunday Times Golden Globe Race. 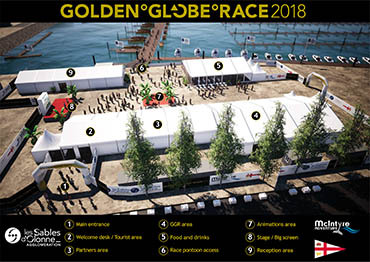 NEW... Latest chart of the Golden Globe Race course around the world. 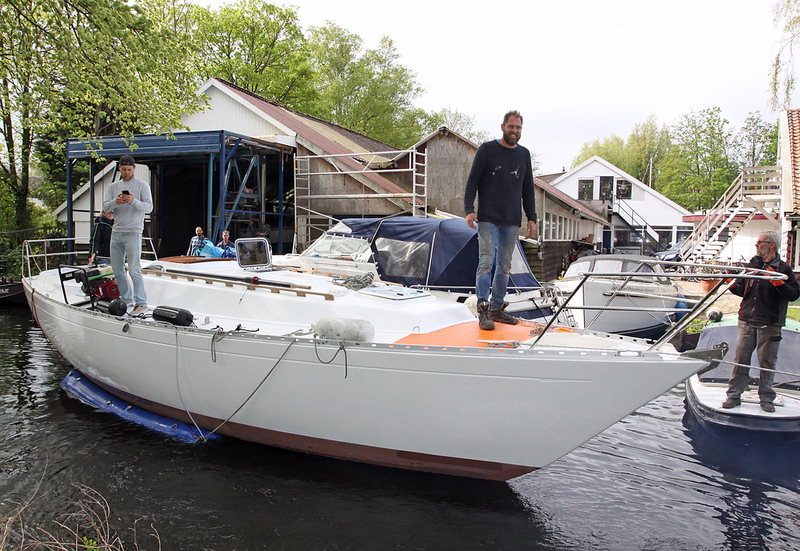 Mark Slats on the foredeck overseeing the launch of his Rustler 36 MAVERICK in Wassenaar, Netherlands, where the yacht has been prepared over the winter. 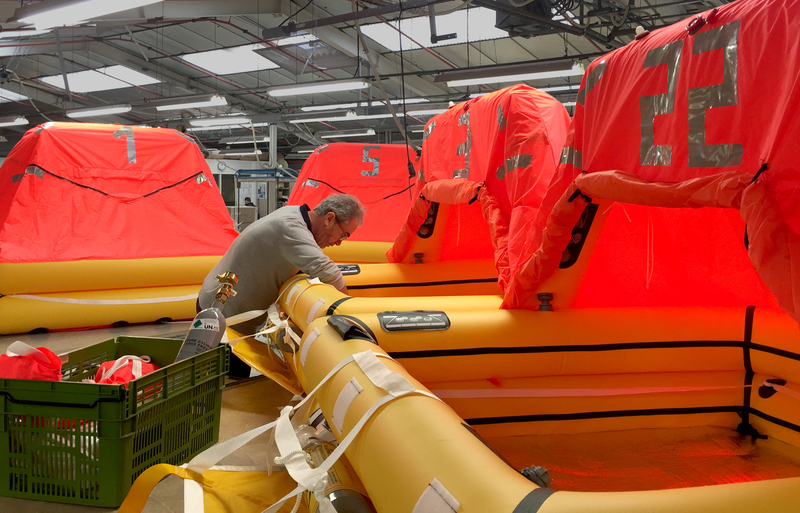 Final checks on the Plastimo GGR liferafts selected by 16 of the GGR skippers. This newly designed smaller liferaft has taken 12 months to develop and meets all International standards. 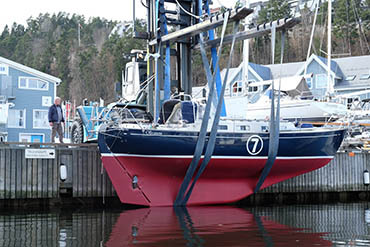 American Istvan Kopar sets out on transatlantic crossing; 5 more yachts launched and 4 more are imminent. 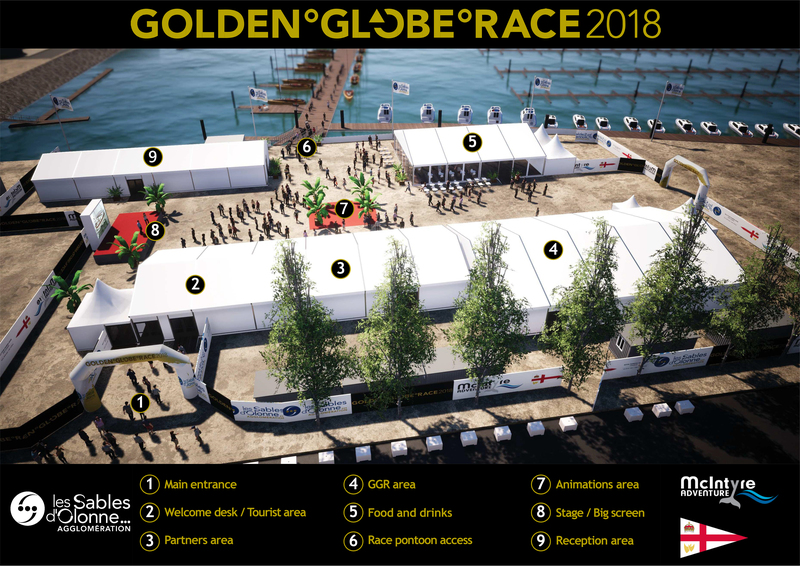 With just 2 months to the start of the Golden Globe Race from Les Sables d’Olonne on July 1st, skippers are working feverishly to complete their preparations ready to take part in the Suhaili 50 Falmouth Parade of Sail celebrations between 11-14th June. French skippers Antoine Cousot (Métier Intérim) and Jean-Luc Van Den Heede (Matmut) have just had their boats baptised and are now busy sailing; Ertan Beskardes (GBR) has reached Vigo with just the Bay of Biscay to cross before reaching Falmouth during his long solo delivery voyage from Sardinia; Istvan Kopar (USA/Hungary) set sail from Oyster Bay New York on April 29 at the start of his long transatlantic voyage to the start - visit; Australian Kevin Farebrother now has his Tradewind 35 Sagarmatha sailing out of Les Sables d’Olonne and was joined last week by Philippe Péché (FRA) after making a 2-day solo passage to test his wind vane self steering system. Plans are now well advanced to celebrate the 50th anniversary of Sir Robin Knox-Johnston’s departure from Falmouth at the start of the Sunday Times Golden Globe Race back in 1968. Sir Robin, returning with his yacht Suhaili, will be joined by two other history-making yachts, Sir Francis Chichester’s Gipsy Moth IV and Sir Alec Rose’s Lively Lady and the 19-strong GGR fleet, which will be based at Falmouth Haven Marina from 11th-14th June. Lively Lady, in which Sir Alec completed a solo circumnavigation around the three great Capes with two stops back in 1968, is currently undergoing a complete refit near Portsmouth. “We’ve suffered some delays but are determined to join the Suhaili celebrations, even if the paint is still wet!” Says Alan Priddy who has led yacht’s restoration. Lively Lady will then return to Portsmouth to mark her own 50th anniversary of Sir Alec’s victorious return on 4th July.” Visit www.livelylady.org. Visitors will discover the GGR yachts and skippers sailors on the Vendée Globe pontoons, and admire the historic solo yachts – Sir Robin Knox-Johnston’s Suhaili, Bernard Moitessier’s Joshua and Sir Francis Chichester’s Gipsy Moth IV, together with Eric Tabarly’s Pen Duick III. There will be something for all ages: Learn to navigate with the stars and instruments of the past, attend conferences, interviews and demonstrations, participate in workshops and boat baptisms, and enjoy the conviviality of the Bar Guinguette during evening concerts. Start July 1st:	09.45am GGR yachts leave the marina 12:00 : Race Start – broadcast live on France 3 and L’ÉQUIPE TV. The broadcast is also free for other stations to air. The Race Office will open in Les Sables d’Olonne on May 7 and already, more than 100 volunteers have been enrolled to support the event. The Race Village will open on Sunday June 16 with the conclusion of the SITRaN Challenge Race from Falmouth. The GGR fleet and historic yachts will remain on public display until the start on Sunday July 1. The start timings have been revised. The GGR yachts will start leaving the dock at 09:45 and the Race will commence at Noon from a line marked by Suhaili at one end and Bernard Moitessier’s Joshua at the other. Sir Robin Knox-Johnston will fire the starting canon. Interview opportunity with Sir Robin Knox-Johnston. The winner of the Sunday Times Golden Globe Race and first man to sail solo non-stop around the Globe will be available for one-to-one media interviews via telephone, Skype or in person at Gosport, UK on 15th and 17th May. CNN MainSail looks back at the stories to come out from that first Golden Globe race back in 1968. Host Shirley Robertson meets the 1968 winner Sir Robin Knox Johnston, who explains how he and his boat Suhaili, which at 32 feet was one of the smallest in the race, survived the remarkable voyage. 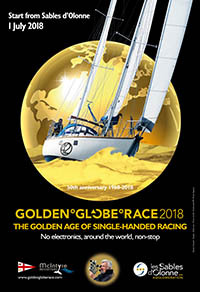 The race was the precursor to the current Vendée Globe, a 74-day sprint around the planet in cutting edge, high-end monohulls, but this year’s re-enactment of the Golden Globe is expected to take four times longer. 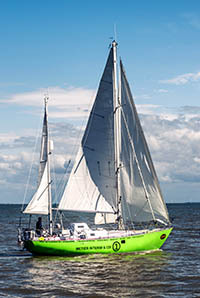 In homage to the nine original entrants, the participants, including adventurers like firefighter Kevin Farebrother, who has mounted the summit of Everest three times, will depend on traditional skills of seamanship, paper charts, astro navigation, 30-year-old boats and the prospect of nearly a year alone at sea. The GGR welcomes two new supporting sponsors, Plastimo and PPL Media, which join Les Sables d’Olonne Agglomération, Presenting sponsor McIntyre Adventure, official timekeeper RALF TECH watches and Hydrovane self steering. Plastimo has worked closely with GGR organisers over the past 12 months to develop a smaller liferaft specifically for the Race that meets international safety standards. Sixteen of the GGR skippers have adopted it so far. PPL Media is the official distributor of images during the Golden Globe Race. Click Here to download the Boat Stats (xlsx). Click Here to download Skipper stats (xls).